There’s a new church in town, and it wants you to know it plans to become visible to the community. Hill Crest Bible Church began worship services on November 4. They rent space at the First United Methodist Church. 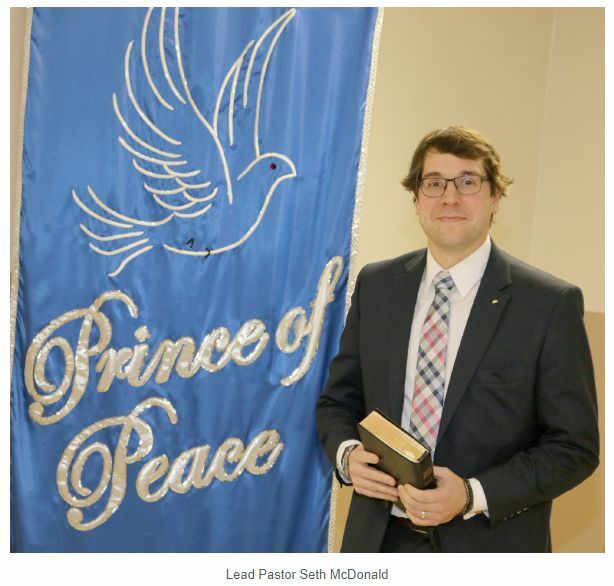 A grassroots church founded by Lead Pastor Seth McDonald, its membership already has approximately 100 members from the community and from those Seth knew growing up. Although McDonald went to Wayne State University for Mortuary Science, he felt the calling to become an ordained minister. He grew up in the ministry, son of a Senior Pastor at a local church for 43 years until his passing last year. Seth was the Youth Pastor at that church. After his dad died, Seth started the new Hill Crest Bible Church which his mother now attends. Members range from two-months young to 84 years old. There are about 15 young children and about 15 teens in attendance each week. Seth and his high school sweetheart wife, Jerri-Lynne, have two kids. Now Seth wants Hill Crest Bible Church to be a part of the community. To do that, he feels the church needs to serve the community. Last October, they held a trunk or treat night; in December- a tree-lighting ceremony at the museum; future plans include events in the park that the community can attend, even a community worship time in the park. He wants to instill in the hearts of the people that they are loved and serving others is their mission. Pastor McDonald wants to be part of bringing Wayne back together. For now, various church members come together on the nights that the Wayne City Council meets and pray for the City Council. Worship times for Hill Crest Bible Church on Sunday mornings: Sunday School at 10:00 a.m. and Worship at 11:00 a.m and 6:00 p.m.
On Wednesdays at 6:30 p.m.: Bible Study for all ages.